Ottawa, ON, August 15, 2013 – According to statistics released today by The Canadian Real Estate Association (CREA), national home sales were little changed on a month-over-month basis in July 2013. National home sales edged up 0.2% from June to July. 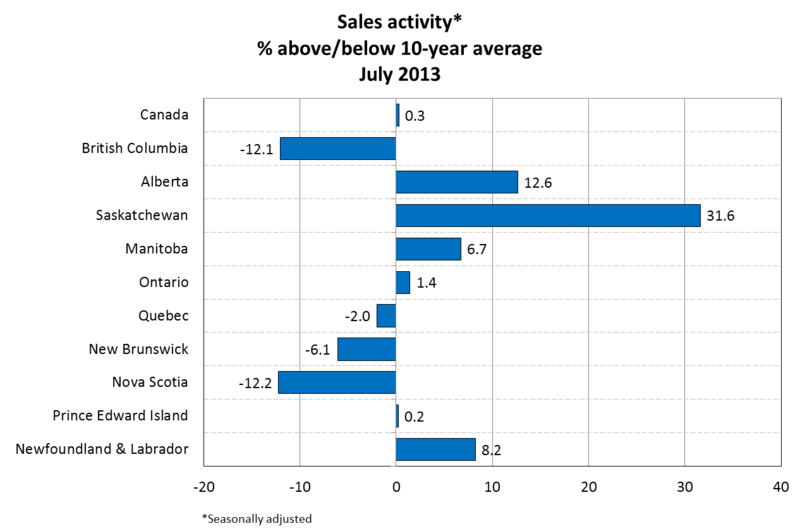 Actual (not seasonally adjusted) activity came in 9.4% above levels in July 2012. The number of newly listed homes edged down 0.4% from June to July. The national average sale price rose 8.4% on a year-over-year basis in July. 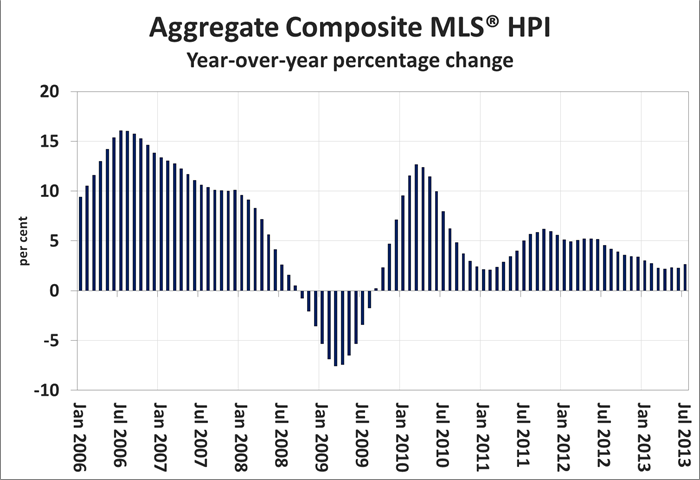 The MLS® Home Price Index (HPI) rose 2.7% year-over-year in July. 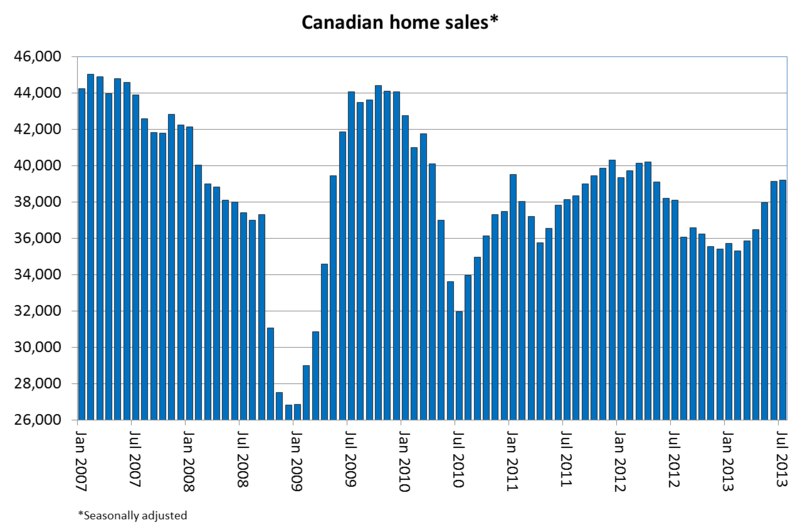 The number of home sales processed through the MLS® Systems of real estate Boards and Associations and other cooperative listing systems in Canada was little changed on a month-over-month basis in July 2013. Sales edged up just two-tenths of a percentage point to hold below levels reached prior to tightened mortgage regulations last year. The number of local markets where sales improved on a month-over-month basis ran roughly even with those where activity edged back in July. Outsized gains in Greater Toronto and Greater Vancouver tipped the balance, resulting in a small increase at the national level. Actual (not seasonally adjusted) activity came in 9.4 per cent ahead of levels reported in July 2012. Sales were up on a year-over-year basis in three of every five local markets, led by double-digit gains in Greater Vancouver, Calgary, Edmonton, and Greater Toronto. In Greater Toronto and Greater Vancouver, increases reflect sales trends that were already weakening at this time last year. Some 284,865 homes have traded hands across the country so far this year. That stands 4.6 per cent below levels in the first seven months of 2012. The number of newly listed homes edged down 0.4 per cent on a month-over-month basis in July. As with sales activity, the number of local markets where new supply increased was equal to those where it declined. However, due to its size, the decline in new listings in Greater Toronto tipped the balance slightly negative at the national level. With both sales activity and new listings little changed in July, the national sales-to-new listings ratio was 54 per cent. This remains roughly on par with June’s reading of 53.7 per cent. While the national housing market has tightened slightly in recent months, it remains firmly rooted in balanced market territory where it has been since early 2010. Based on a sales-to-new listings ratio of between 40 to 60 per cent, two-thirds of all local markets were in balanced market territory in July. The number of months of inventory is another important measure of balance between housing supply and demand. It represents the number of months it would take to completely liquidate current inventories at the current rate of sales activity. At 6.1 months, the measure was unchanged from June to July. The number of months of inventory was higher in July than in June in more than half of all local markets, and stood above the ten-year average for the month of July in about 70 per cent of all local markets. The actual (not seasonally adjusted) national average price for homes sold in July 2013 was $382,373, an increase of 8.4 per cent from the same month last year. The Aggregate Composite MLS® HPI rose 2.7 per cent compared to July 2012. Year-over-year growth in the price index has slowed since late 2011 and has held steady between two and three per cent for the past six months. Year-over-year price growth picked up for two-storey single family homes (+3.3 per cent) and apartment units (+1.3 per cent), but slowed for one-storey single family homes (+2.7 per cent) and townhouse/row units (+1.0 per cent).